The scale reference image below showing the Lander, Drill (Boring machine) and Submarine was the first drawing created for this project and will be one of the first models sculpted in Dreams after release. These models will be used for the ship exterior in the introduction cinematics the lander nosecone and rear sections will also feature crashed on Europas surface. 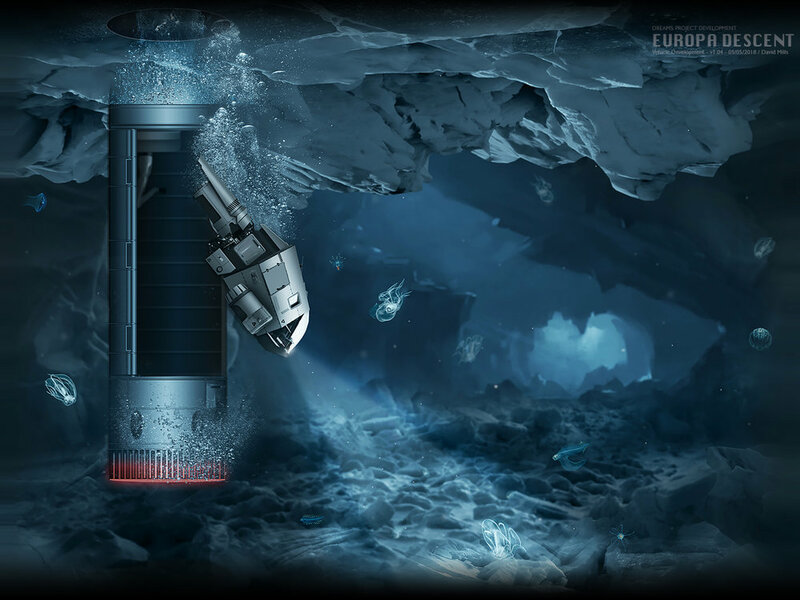 Towards the end of the second chapter the player will extend the boring capsule from the landers cargo bay and drill/melt into the ice, when the boring device hits liquid the rear slides open and the sub is released. On Europa descent the nose and tail section of the lander separate and impact Europa independently. Narrative will direct the player to locate and interact with both sections in order to repair key systems and progress the main story. At the conclusion of the surface gameplay the player will descend in the boring capsule through the ice shelf and into a network of submerged caverns and tunnels. When the autonomous boring capsule detects liquid water the rear section opens and a sub is extended on a robotic arm.